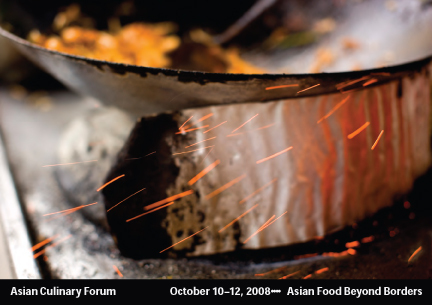 In October the Asian Culinary Forum will be staging, from October 10-12 in San Francisco, its First Annual Symposium, 'Asian Food Beyond Borders' . The Friday-evening-through-Sunday lineup comprises a series of events (such as a tasting tour of Asia's six flavors, cooking demonstrations, a how-to on deciphering Asian ingredients, and a walking tour of San Francisco's Chinatown), capped off by a full-day symposium featuring some great speakers. If this piques your interest but you're not going to be around all weekend, no problem - you can register for events individually online. 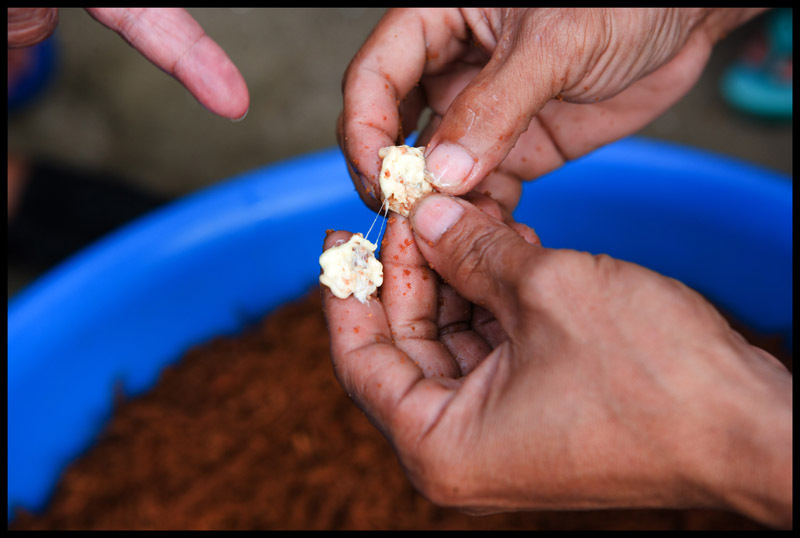 On Friday evening I'll be at the 'Asian Sweet' station offering a tasting of some of the wonderful small-batch palm sugars that Dave and I have picked up in the course of our research around Southeast Asia. 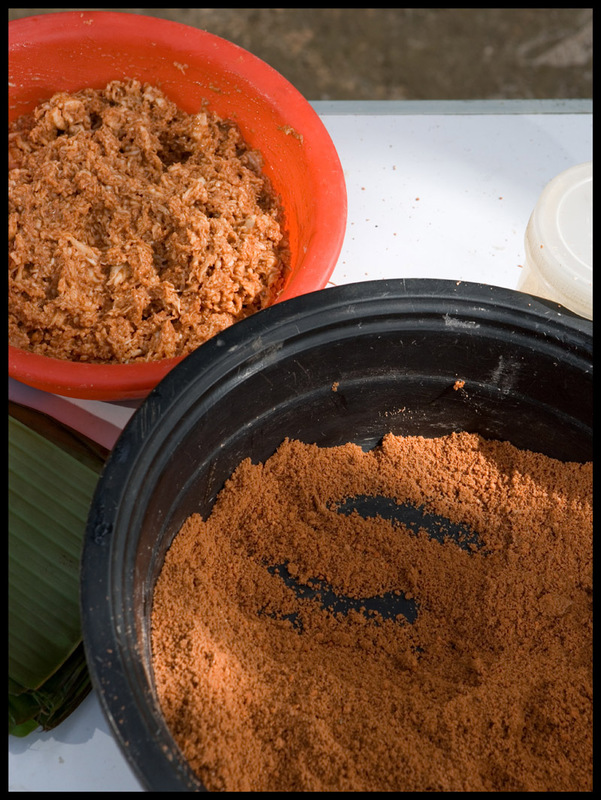 Ever wondered why blond Cambodian palm sugar tastes nothing like mahogany-hued gula Melaka? Come by and find out! I'd love to see you there. 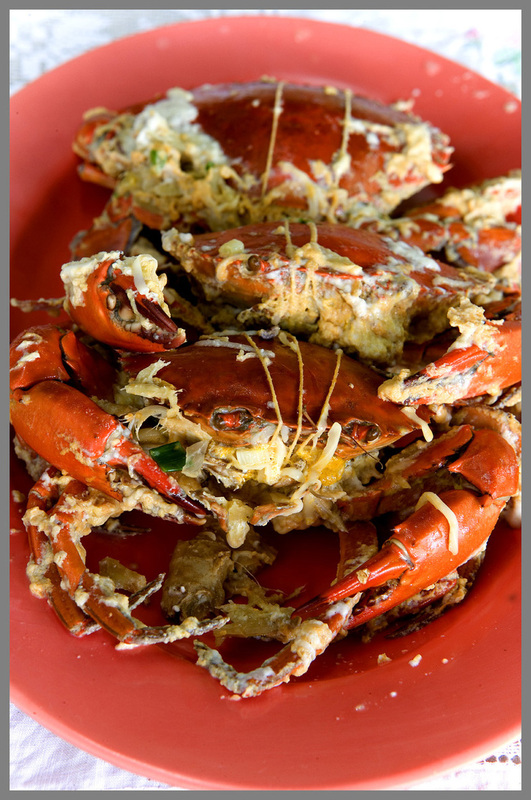 Check out the July issue of Travel+Leisure Southeast Asia for our article on five classic Philippine dishes (or, more accurately, four dishes and one beverage). 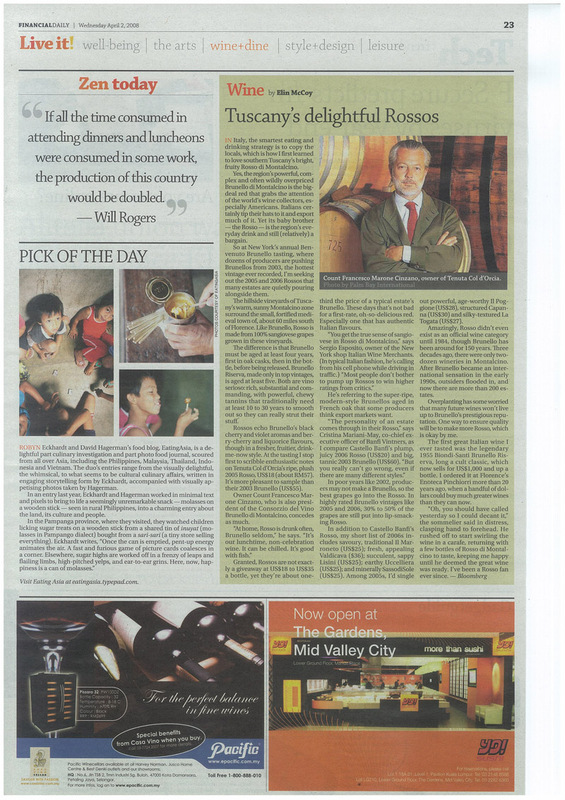 It's about time the Philippines got some print props (outside of the Philippines, that is) for its food. It's only a two-page spread but hey, it's a start. The Salcedo Market will host a Pampango festival of regional delicacies and local crafts on June 21 as part of the market's commitment to showcase the best of Philippine food culture. As part of its fourth anniversary celebrations, the Salcedo Community Market has also invited the critically-acclaimed Arti Sta Rita to provide entertainment during the event, which will be held at the Jaime Velasquez Park during market hours from 7am to 3pm. 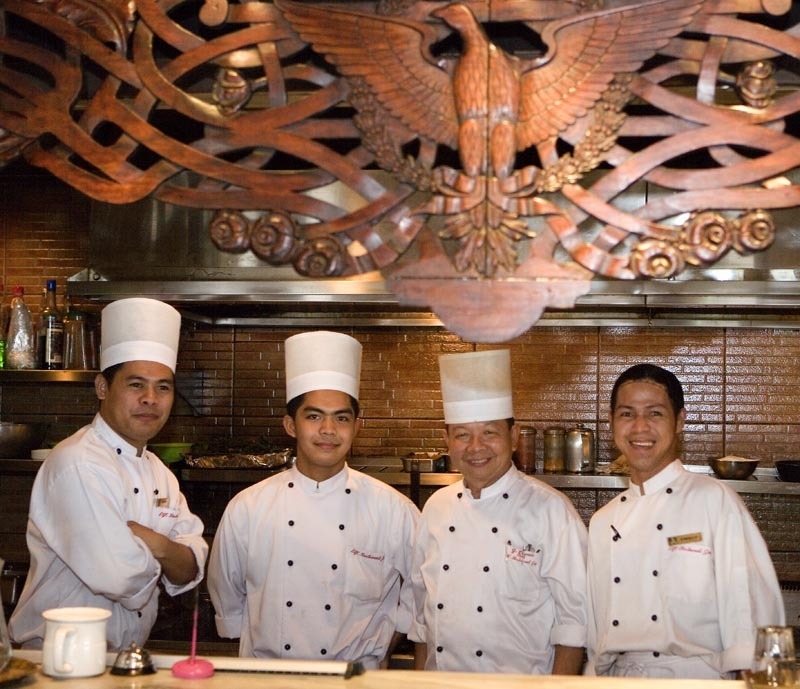 Look for genuine Pampango cooks doing what they do best, and the food specialties that have made the region famous for its cuisine. 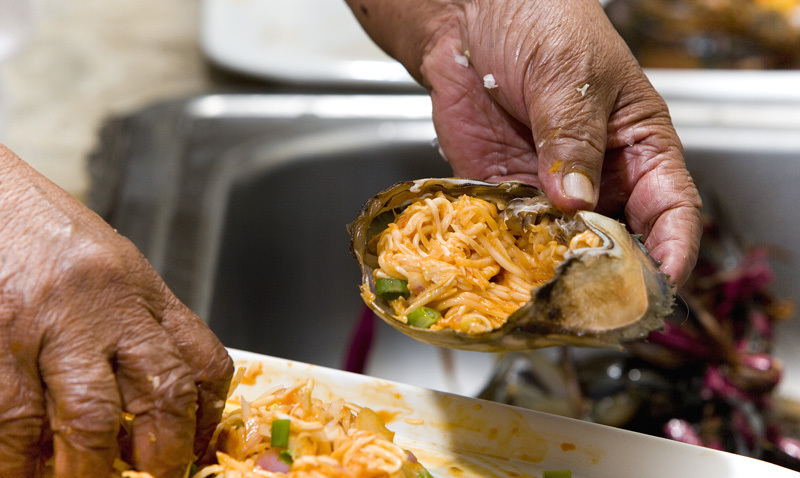 There will also be cooking demonstrations of heirloom recipes from the province's oldest families. 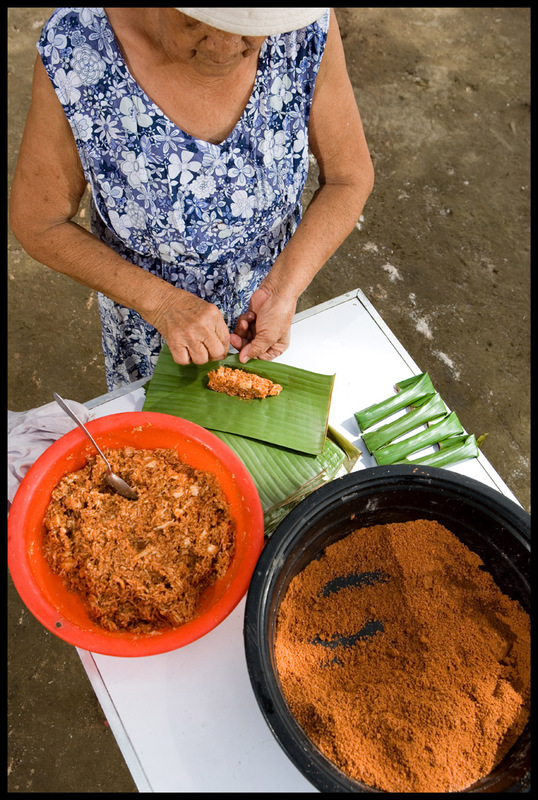 In addition, there will be an on-site demonstration of how the world-famous San Fernando parols are made by local craftsmen brought in especially for the occasion. Wish we could be there. If you will be, have some halo-halo, bringhe, and plantanillas for us. 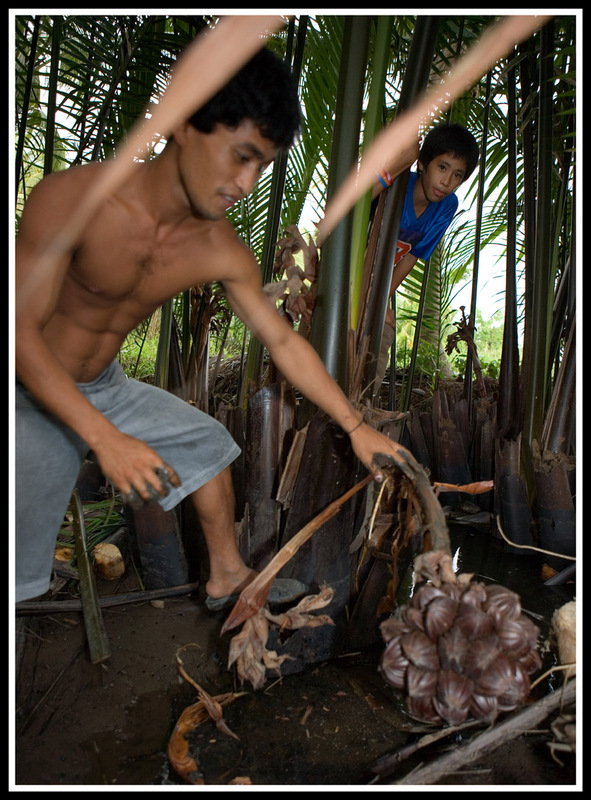 Sago isn't the only palm that's mined for food in the Philippines. 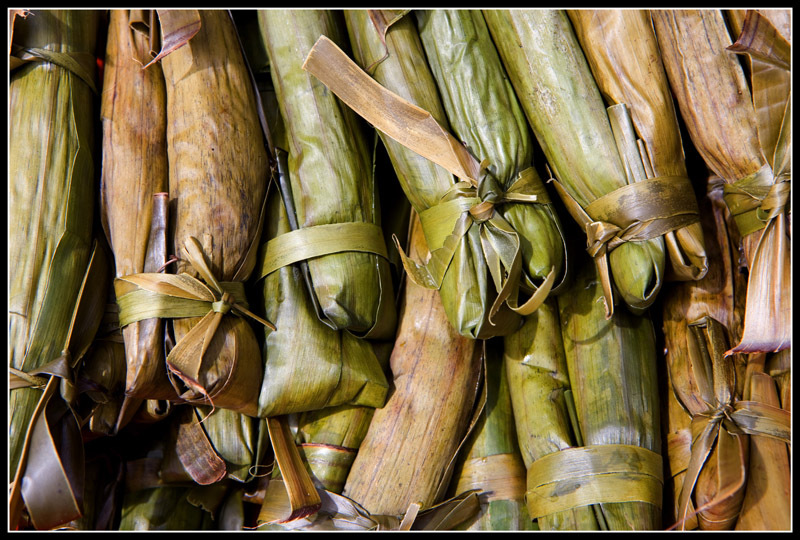 Nipa (Nypa fruticans) - and other palm varieties, including coconut and aren - are tapped to produce suka (vinegar), a Filipino kitchen staple, mildly alcoholic tuba, and more alcoholic laksoy. 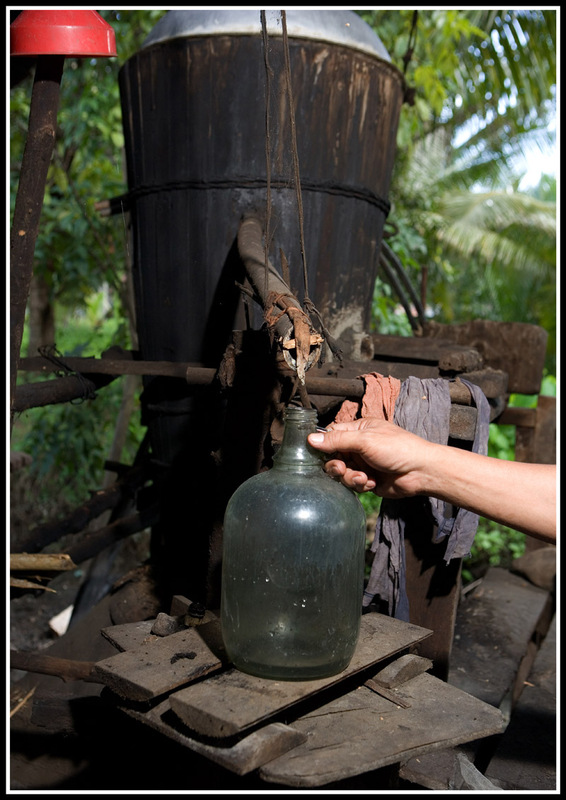 Elsewhere in Southeast Asia this same sap is boiled to make sugar. Such may also have been the case in the Philippines before the Spanish introduced cane sugar cultivation. 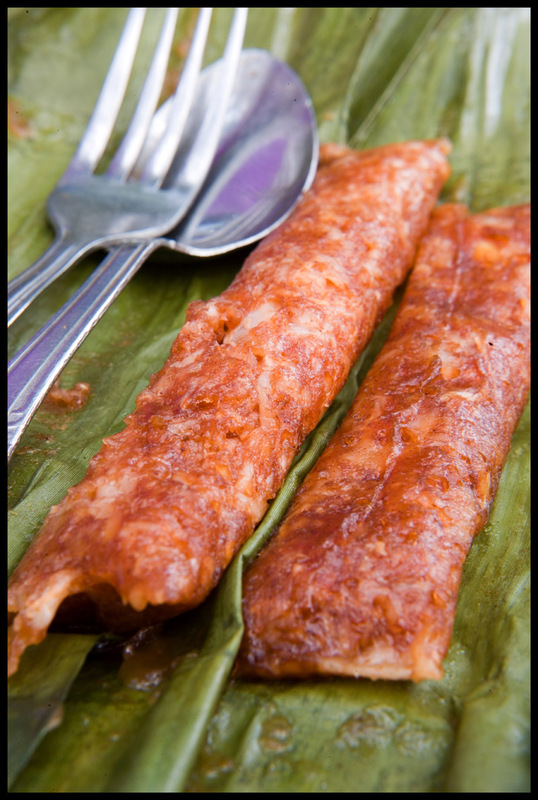 You'll often hear it said that coconut, aren, and nipa vinegar (and gula Melaka) are made from the sap of palm trees. That isn't quite the case - what's tapped are not the trunks of these trees but the stalks of the trees' flowers. 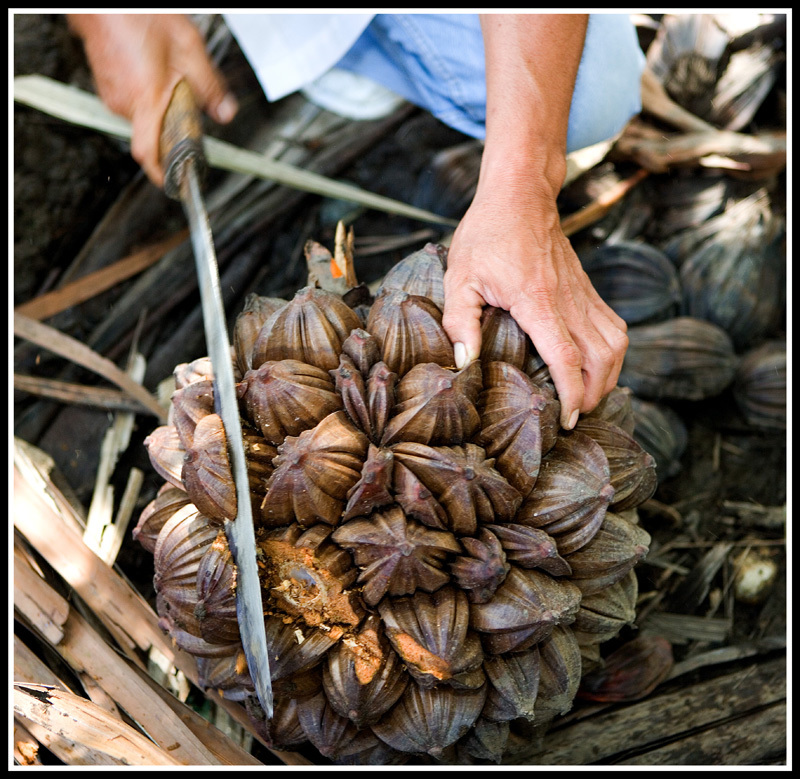 Among the three varieties the nipa palm is unusual in that its stalk is cut and the sap harvested only after the flower has bloomed. 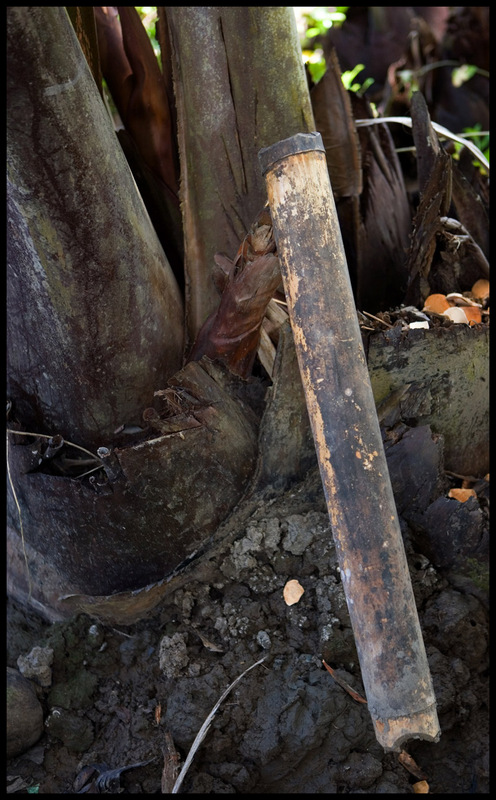 Nipa palms grow in muddy areas near brackish water. Unlike coconut palms, they're low-to-the-ground; their trunks actually grow horizontally beneath the surface of the earth, with branches jutting up in clumps. This makes harvesting the tuba (sap) relatively easy as the tapper doesn't have to scale a ladder to ready the flower stalk and collect sap. 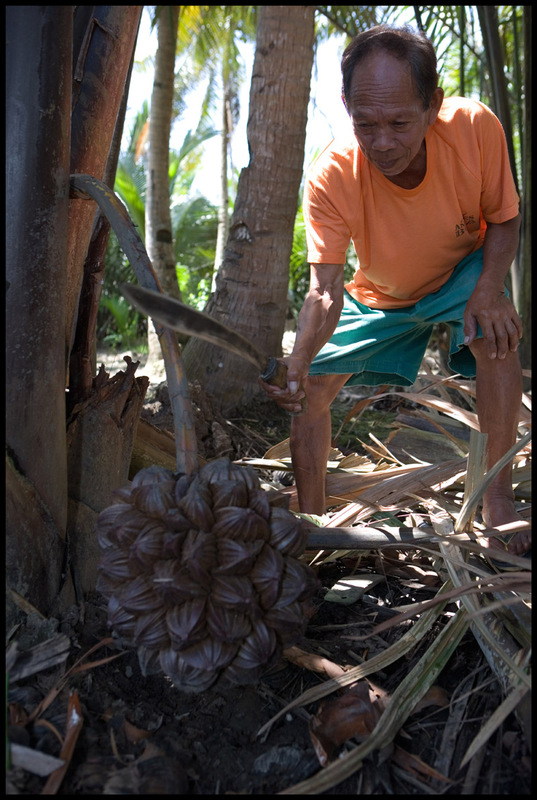 Above, a resident of Barangay Banza in Mindanao's Butuan City prepares a flower stalk for tapping, by bending it down and away from the trunk of the palm, rubbing it with mud, and massaging it. The idea is to loosen the fibers inside the stalk enough to get the sap flowing without pulverizing them; this he'll do a couple times a day for a couple of weeks. To determine whether or not the stalk is ready to be cut, he hacks away a bit of the flower to get at one of the white crispy nuggets hiding inside each 'petal'. 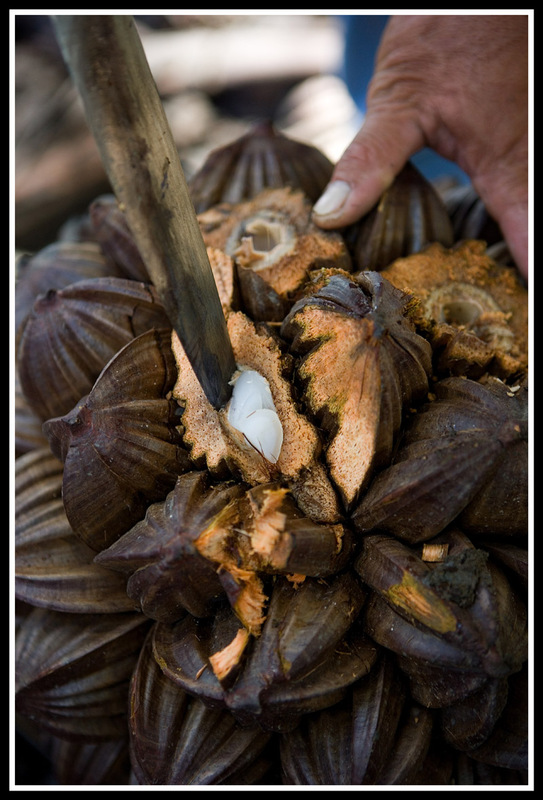 These 'nuts', by the way, are also harvested and eaten as is or candied to make a nata de coco-like treat sometimes called 'palm seeds' and sold in jars of sugar syrup. They show up in halo-halo, and, in Vietnam, in a similar ice treat called che. The stalk is ready for cutting when the flower's nuts are sweet (they also taste a little coconuty). The flower is taken off about six inches from where it attaches to the stalk and, once again, mud is rubbed along its length to draw the sap out (this is the last time the stalk will be mud-rubbed). If the tapper has accurately gauged the readiness of the stalk then sap should start flowing right away. It's captured in a bamboo tube that's attached to the end of the stalk. The tuba is collected twice a day. Its sweet stickiness gums up the end of the stalk, so after each collection the tapper slices off about a half centimter or so to keep the sap flowing. One stalk will produce tuba for about thirty days, by which time it will have been sliced, bit by bit, almost to the trunk. 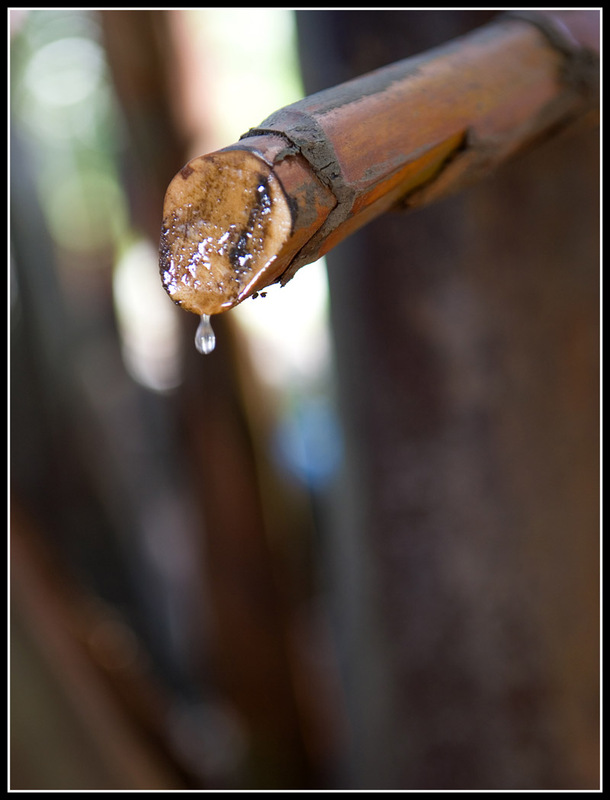 Tuba begins to ferment almost as soon as it drops into the bamboo tube (sugar makers employ a variety of means to hinder fermentation). After it's collected it's added to a big wooden barrel. If left for three days it becomes bahal, the lightly sour, ever-so-slightly alcoholic beyond-tuba-but-not-quite-vinegar that Butuan City Market's kinilaw master Leo uses to dress his fresh fish. After thirty days the tuba becomes suka. 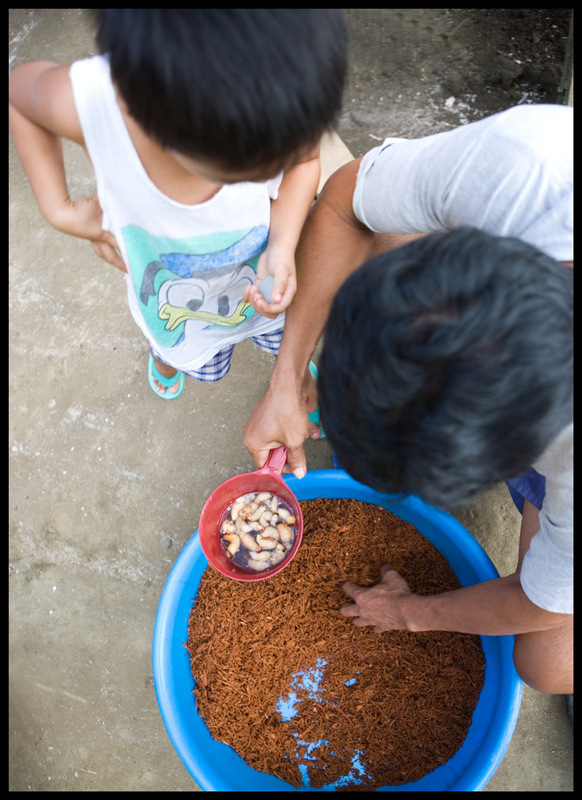 Our host in Butuan City adds extra flavor to his suka in the form of fresh chilies, onion, garlic, ginger, and lots of black pepper. 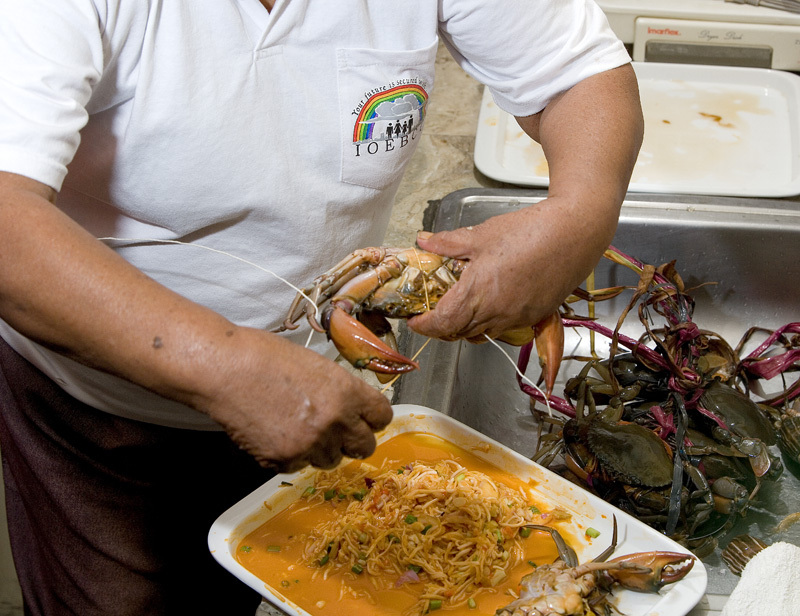 This elixir we greedily spooned over everything from rice to grilled fish to fresh seaweed. 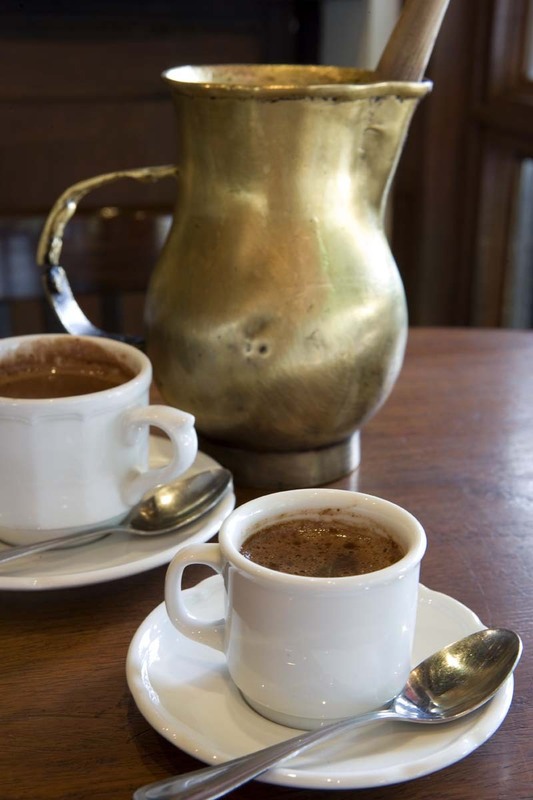 Or, fermented tuba can be made into laksoy, a clear alcoholic beverage. This still, set by the river and shaded by nipa thatch (yet another use for the palm - roofing and walling), is fueled by wood and turns twenty gallons of tuba into about one gallon of laksoy. The stills here in Banza are made of lawaan wood or stainless steel. Wood makes for a much more fragrant laksoy, we're told. Inside the still, the tuba is heated to boiling. The steam that rises condenses on the still's concave metal cap and then drips through a tube, out and into a waiting jug. The first round results in a lightly cloudy beverage. Laksoy isn't crystal clear - and doesn't earn the designation 'first-class' - until it's been distilled a second time. We found first-class laksoy to be more palatable than expected, with a wee bit of a floral scent - definately not rot-gut 'white lightning'. 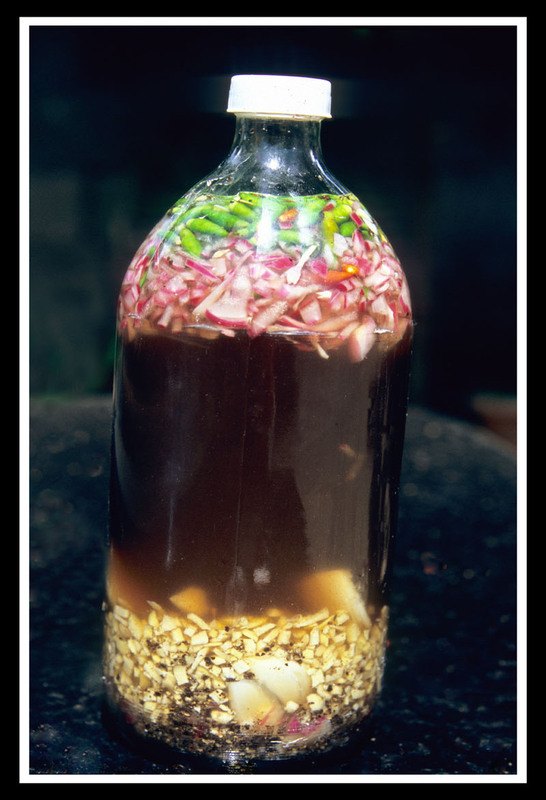 Some locals let raisins and/or ripe jackfruit macerate in the laksoy before cracking the bottle. 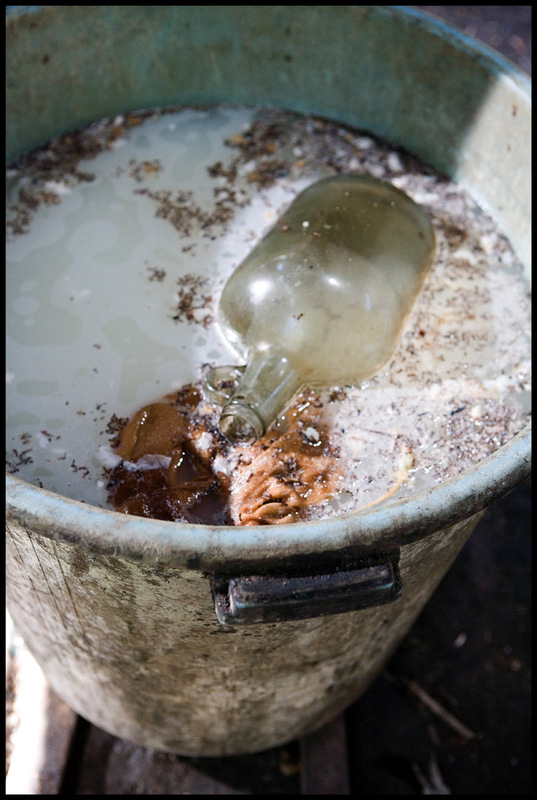 If we had a jug of laksoy we'd treat it as we sometimes do rum: add mango, pineapple, lime rind, and a bit of vanilla bean and stow it away to flavor for thirty days. 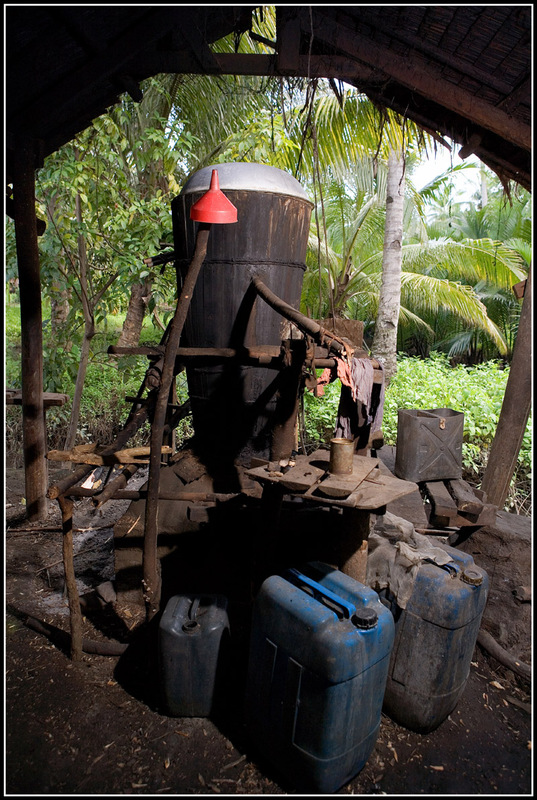 In the barangay stills are a communal asset, supporting on average twenty families each. One lapad (flat, 'pocket-sized' 375 ml bottle) of laksoy fetches 10 pesos (about 25 US cents). 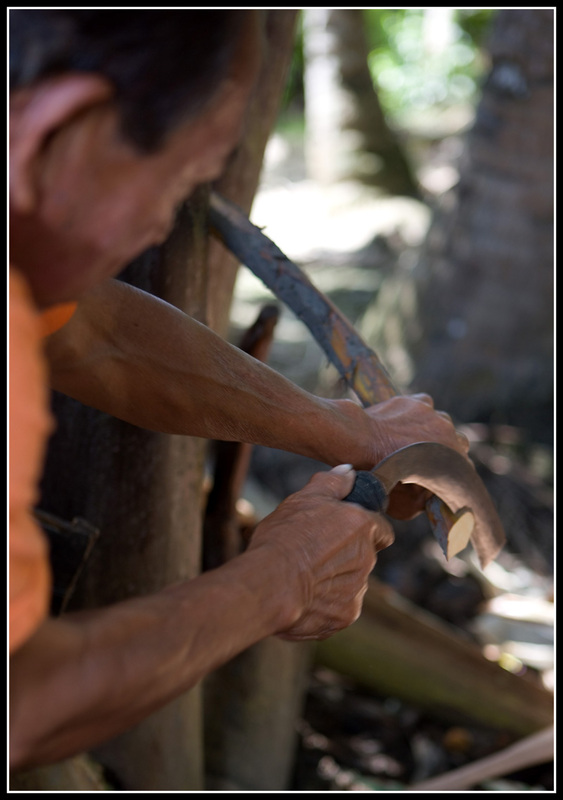 It may not be the tree of life, but the nipa palm is integral to the livelihood of this barangay, at least. The captain tells us that seventy percent of Banza's population is involved in the production of tuba, suka, and/or laksoy, as well as the harvesting of nipa 'nuts'. ... to readers of The Edge Financial Daily (and any other first-timers, for that matter), which made EatingAsia 'Pick of the Day' in yesterday's edition (click and enlarge to read). I'm particularly chuffed that the writer chose to highlight what must be one of my all-time favorite posts, on getting (sugar) high in the Philippines' Pampanga province. Makes me think we should add a 'food culture' category to the side bar (and for more photos, food culture-focused and otherwise, drop by this work in progress). What Do You Do With a Squid the Size of Your Arm? 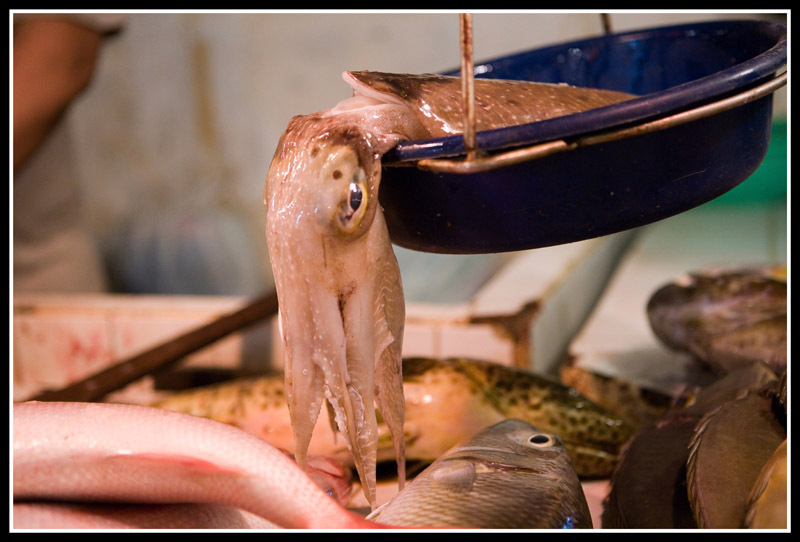 One of the most arresting sights at Butuan City's Seafood Market is the rows of giant squid, slippery bodies big as a small cat, tentacles thick as thumbs, and eyes that are eerily human-like. As I perused the market's offerings thoughts like 'Mmmm, red snapper, chuck it on the grill' and, 'Ooooh, octopus, Italian tomato stew with spinach,' danced through my head. 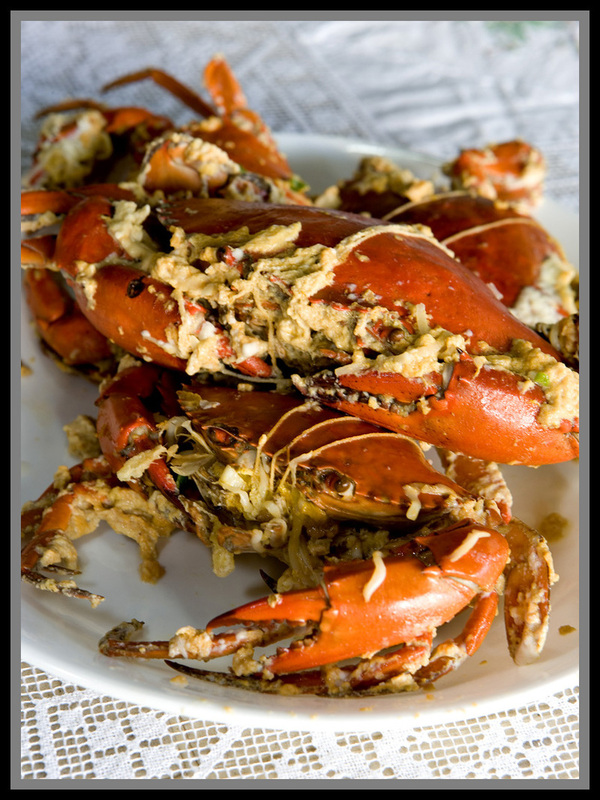 Luckily our host in Butuan City is quite a kitchen wizard, and during that week of non-stop sport eating he turned out a couple of personal favorites that take advantage of the sea beast's bounty. 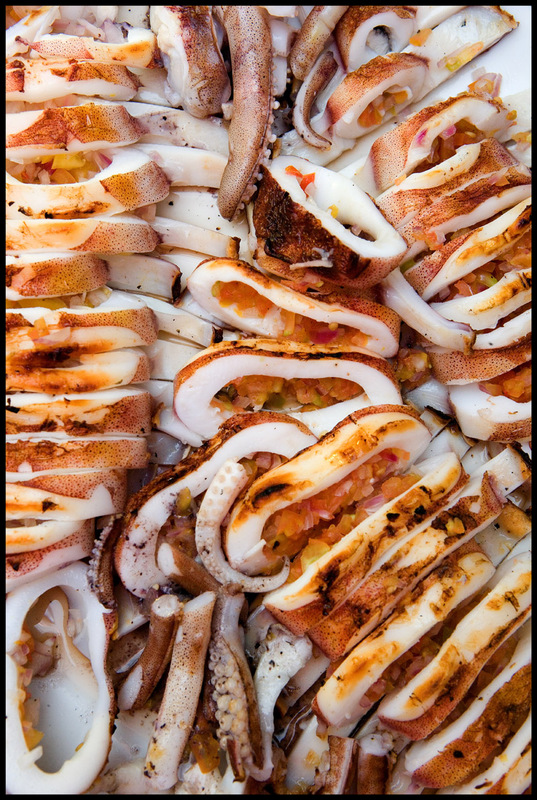 Who doesn't love grilled squid? 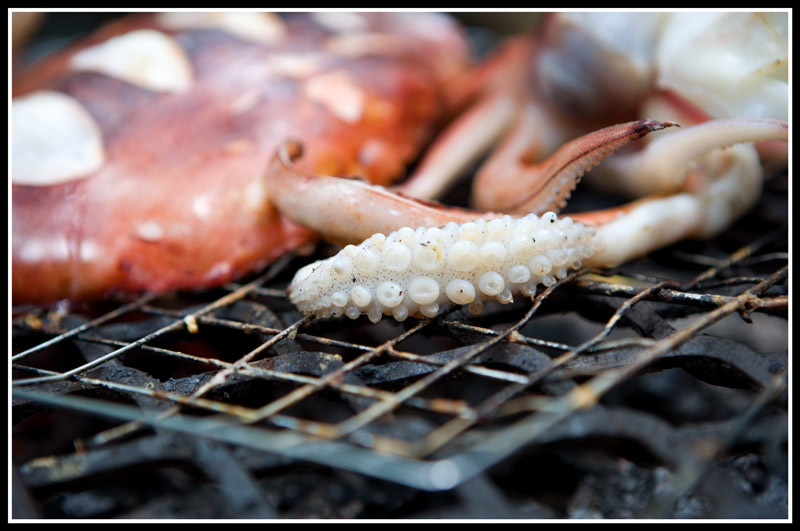 The problem, if you're preparing this at home, is that there's such a fine line between 'done' and 'rubber' that the risk of turning squid into something with a texture akin to a Superball is exceedingly high. With these babies, sheer volume lifts the getting-it-just-right pressure. 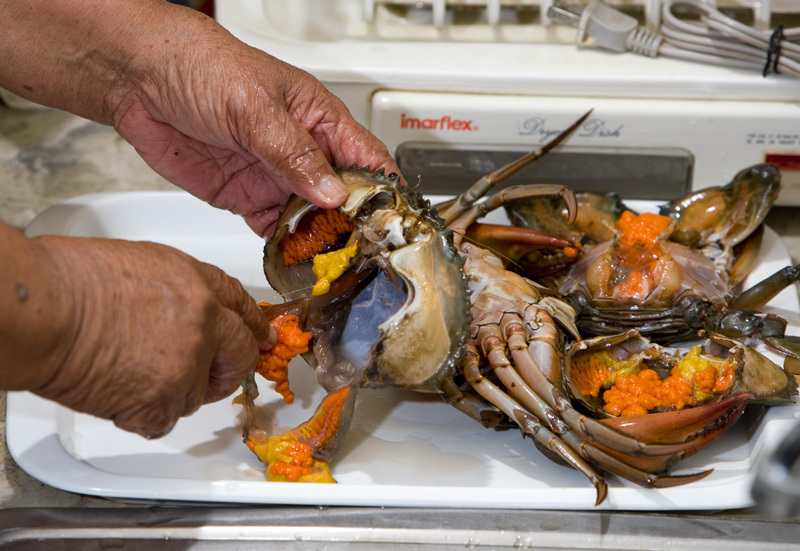 After severing (but not discarding) head and tentacles our host stuffed the skin-on bodies with a mixture of chopped onions and tomatoes and laid it all over low coals. We had a long wait for lunch but the wonderfully tender squid rings sporting a good bit of smoky char on the outside were well worth it. Bigger squid means, of course, more tentacles and Dave, an afficianado, especially appreciated the bounty. 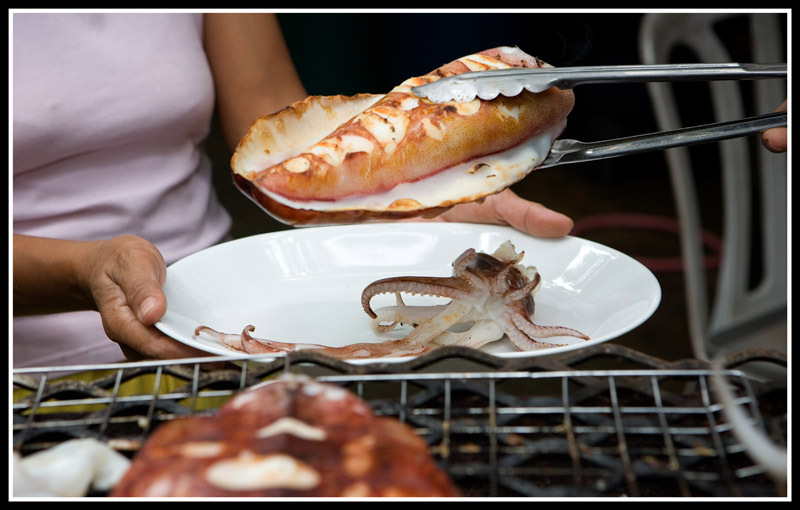 Giant squid heads are a bit of a delicacy and our host urged us to give the eye a try. I passed. 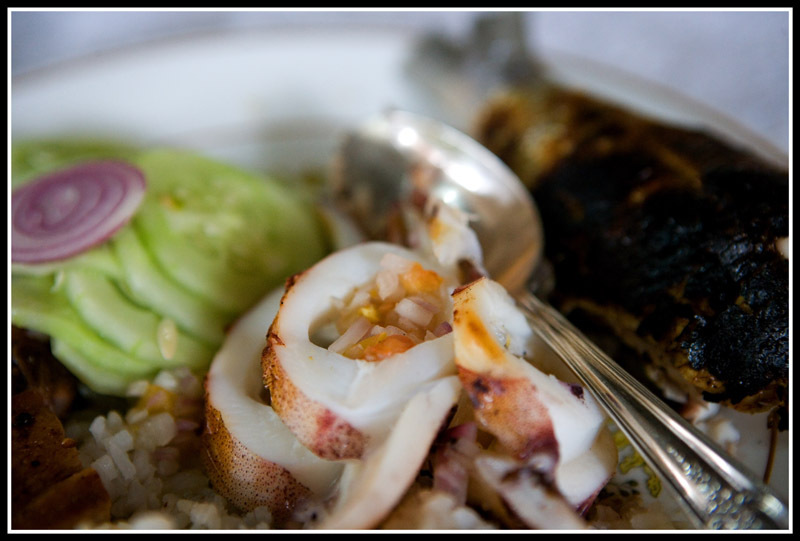 The most surprising giant squid preparation we ate that week was an invention of the house: seafood Bicol Express. Bicol Express, a beloved Philippine specialty alleged to have originated in Bicol province (a vendor at Makati City's Salcedo Community Market also also claims to have invented the dish, so who knows), is a fiery dish made with chopped garlic, onions, chilies, pork, and plenty of rich coconut milk. 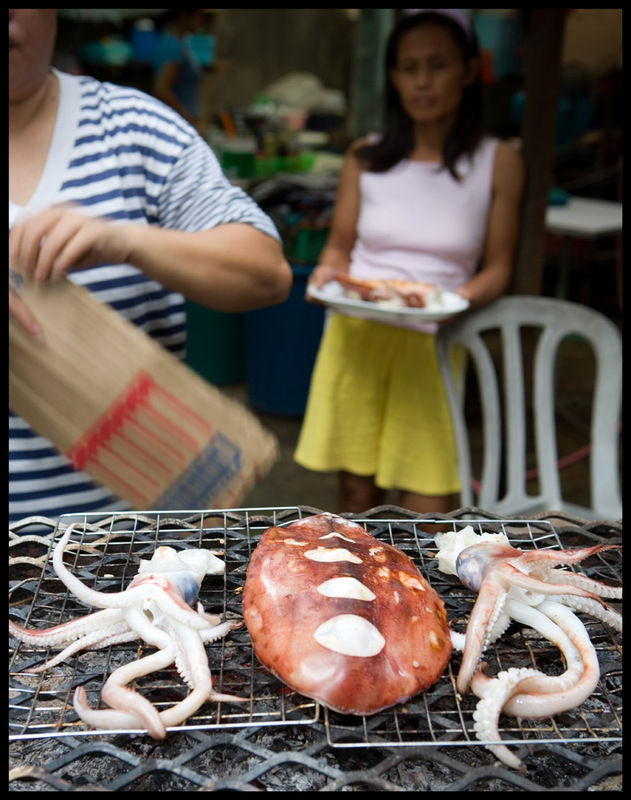 Our host's twist supplements pork with a variety of seafood (including squid tentacles, the nubs you see below), adds salted black beans, and enriches the coconut milk with smashed chicken liver. This will sound like blasphemy to many Filipinos, I know. 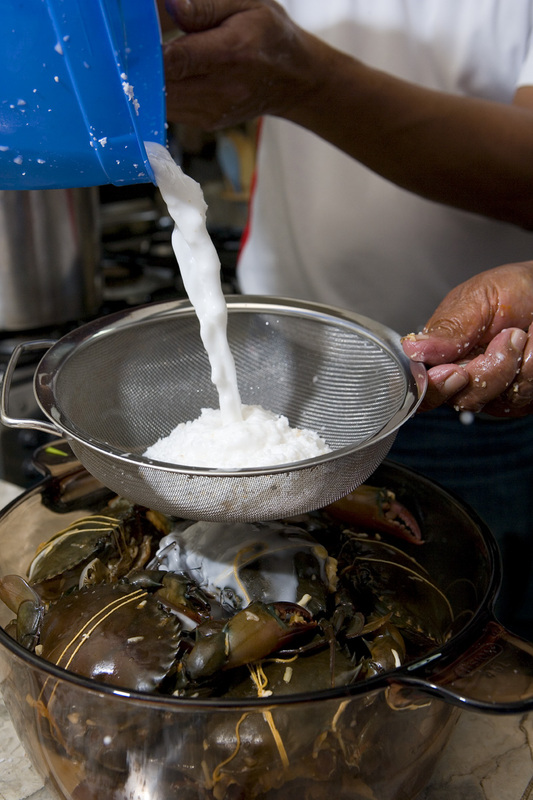 (Does coconut milk ever need to be enriched? 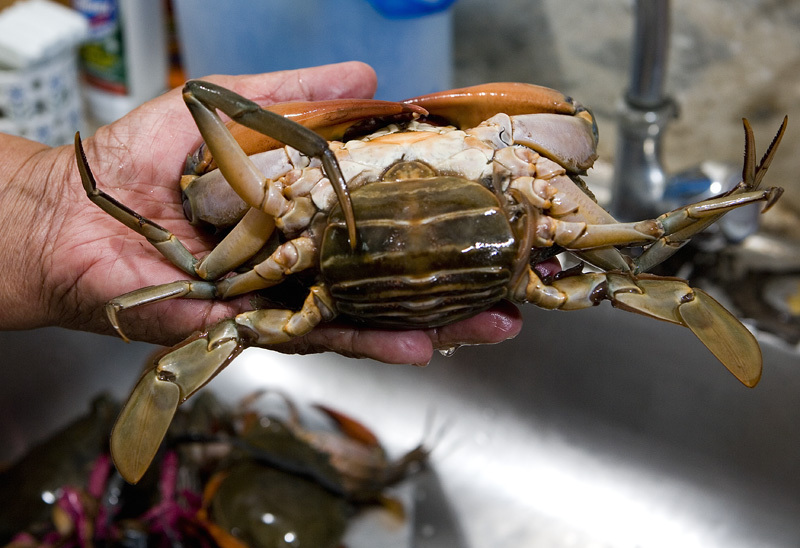 Liver will obliviate any delicate seafood flavor, right? 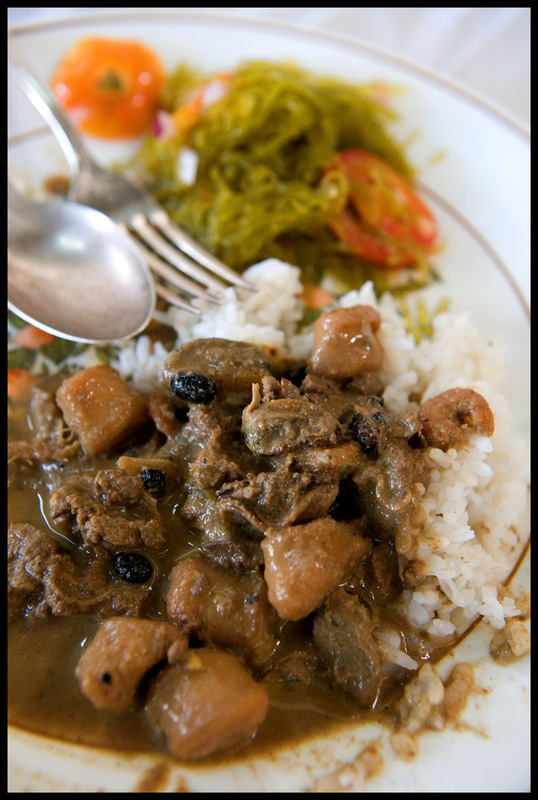 If you add black beans and substitute seafood for pork is it still Bicol Express?) 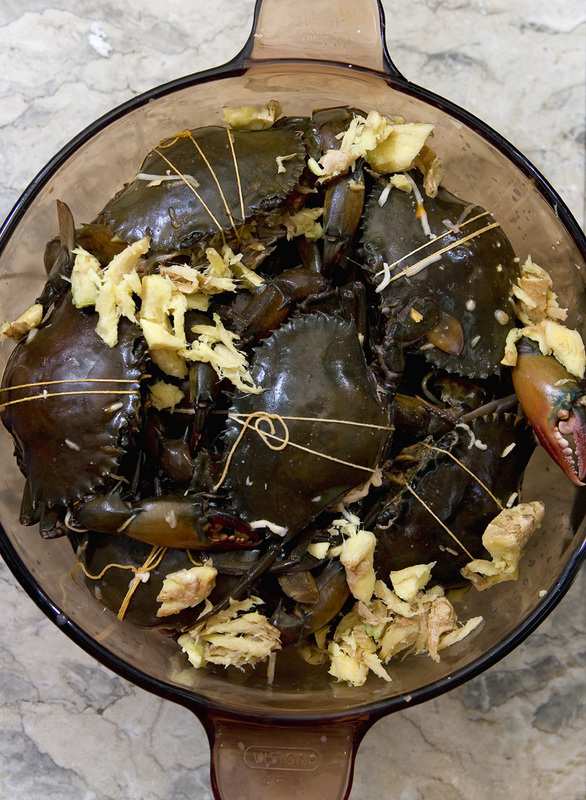 But the result of our host's experiments (he's been perfecting the dish for years, he says) is a sublime - if very rich - stew that, in spite of the presence of pork and those livers, tastes quite forcefully of freshness from the sea. Apologies to those of you with access to giant squid (how do you like to prepare it?) - I didn't think to get the recipe because the beasts are nowhere to be seen in our neck of the woods. The Philippines is blessed with a substantial body of good food writing, both serious literature and research by the likes of Edilberto Alegre and the late Doreen Fernandez, and less 'learned' but nonetheless enjoyable books by professional and amateur food lovers. An hour spent browsing the shelves in the food writing/cookbook section of a Manila bookstore never fails to deliver something surprising and delightful. 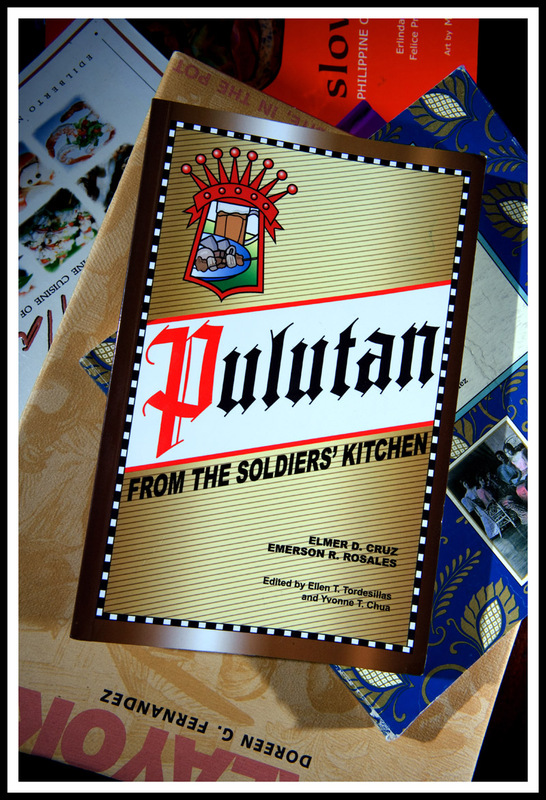 In December I found a couple of gems: a thirty-year-old publication by the Philippine Banana Export Industry Association called 100+1 Banana Recipes, and a slim paperback called Pulutan: From the Soldiers' Kitchen. The first is what its title suggests, a straightforward collection of recipes (written in both Tagalog and English) featuring banana as the main ingredient. 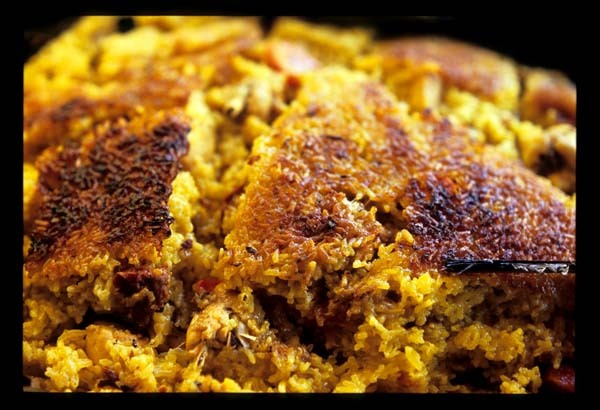 Included are fairly mundane dishes such as banana muffins and banana pudding, as well as recipes for more curious (to the non-Filipino, at least) concoctions such as banana omelet, banana-stuffed bangus (milkfish), banacorn soup (made with corn grits, unripe banana, and green onion), and banana chicken with ubod (palm heart). It's a quirkily enjoyable illustration of the centrality of the banana in Philippine cuisine - for less than U$5. 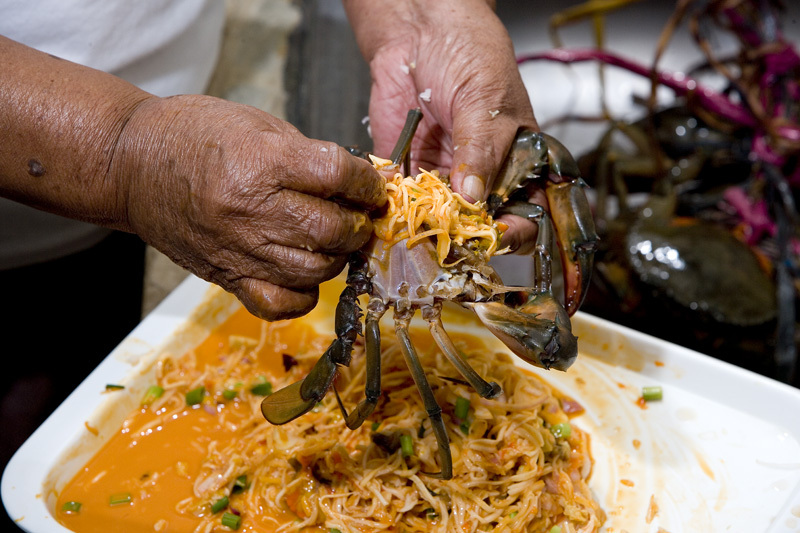 'Pulutan conveys many things Filipino. That is probably why there is no English word that truly captures the concept of pulutan. 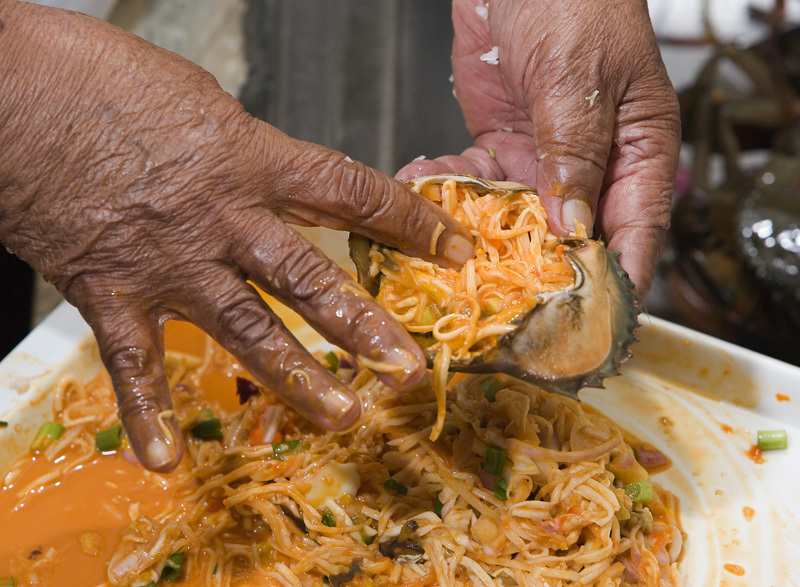 Finger food is not quite accurate because many pulutan are eaten with a fork or with a spoon. Neither is appetizer quite right because pulutan is a meal by itself. In fact, when the plate stops being replenished, that means it's time to go home. Pulutan conjures comraderie. A drinking session is the Filipino concept of breaking bread. Pulutn is the bread. Each chapter ('All Time Favorites', Goat Meat, Lasang Exotic, 'Not the Usual Parts', etc.) opens with a discussion that mixes memories and anecdotes ('For my twenty-sixth birthday in 2005, I wanted something different to celebrate it with classmates who were also fellow detainees. I didn't want the usual spaghetti and fried chicken. 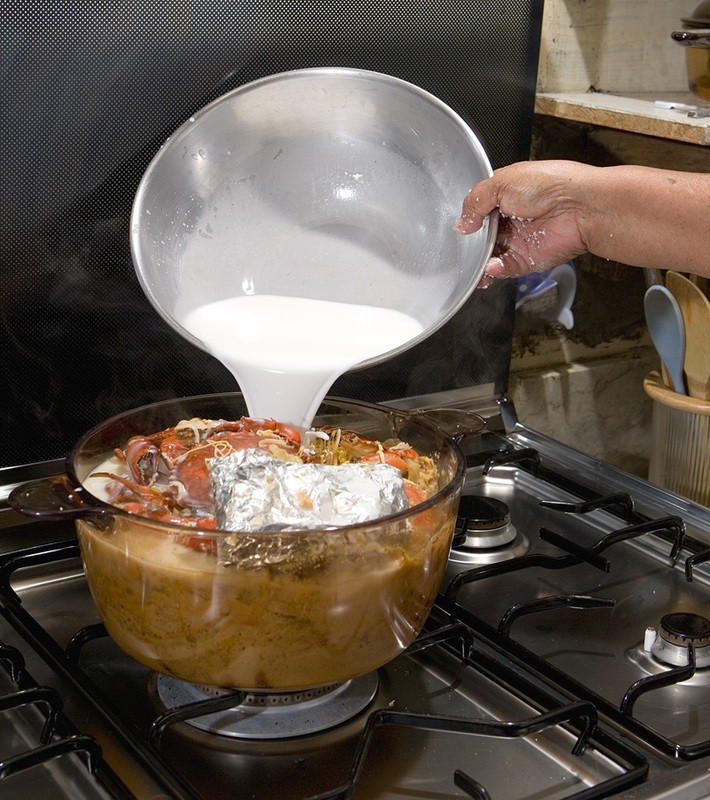 '); Philippine food-related factoids (humba, a pork and vinegar dish, is often served at festive occasions in the Visayas, and a Philippine drinkers' tale says that fathers cook better than mothers because while the latter only learn to cook when they marry, the former learn to cook as soon as they start drinking alcohol); and kitchen tips (when preparing Bloody Belly Grill, an Ilocano dish, 'the swine's blood must be fresh and pure. Do not add water to increase the volume'). Many of the recipes are for dishes that might be 'challenging' to the Western palate. I doubt that I'll ever cook Vampires' Delight, a pork loin preparation that also includes intestines, liver, and fresh blood, or Sinigang na Adidas, sour soup of chicken feet (nails removed). 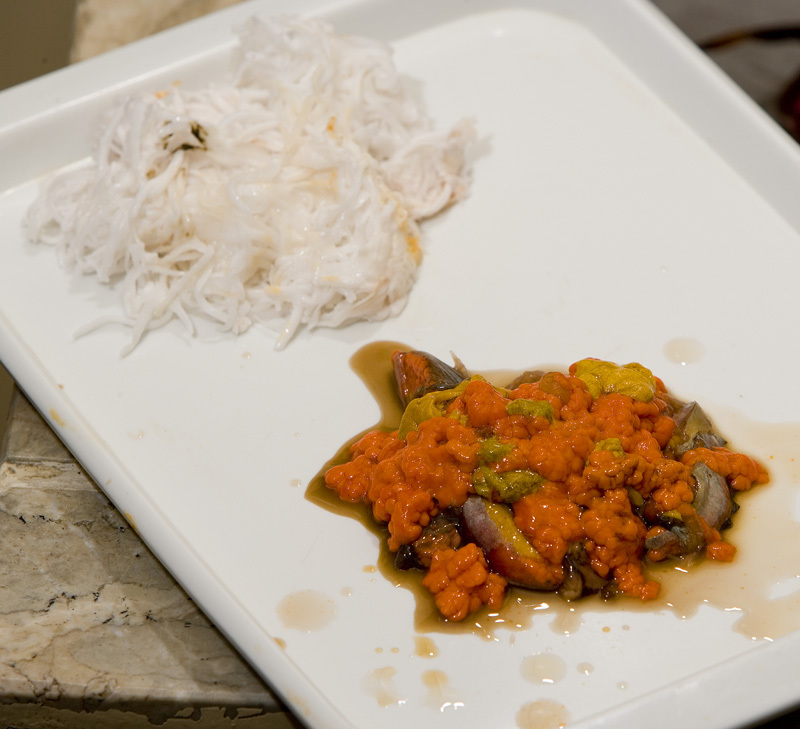 But Ginataang Kuhol (snails cooked with coconut milk, squash blossoms, ginger, and chilies - mussels or other shellfish might be substituted for the snails) sounds delicious, and how can you go wrong with Steamed Stingray? I love books of this sort for the highly focused and sometimes offbeat slices of culinary culture that they offer the reader. 1. 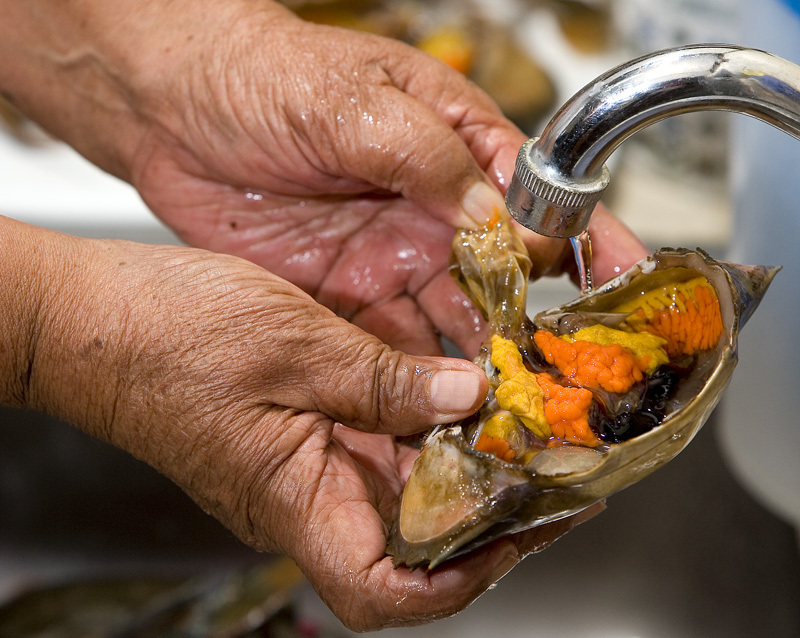 Wash the snails in boiling water and set aside. 2. Heat oil in a pan then saute garlic, onions, and ginger. 3. Add snails. Cover pan and cook for 10 minutes. 4. Add coconut milk, siling haba, and water. Cover pan and bring to the boil. 5. When the sauce is thick, add squash shoots. Season to taste. 6. Turn off heat but leave the pan covered for 5 minutes before serving. 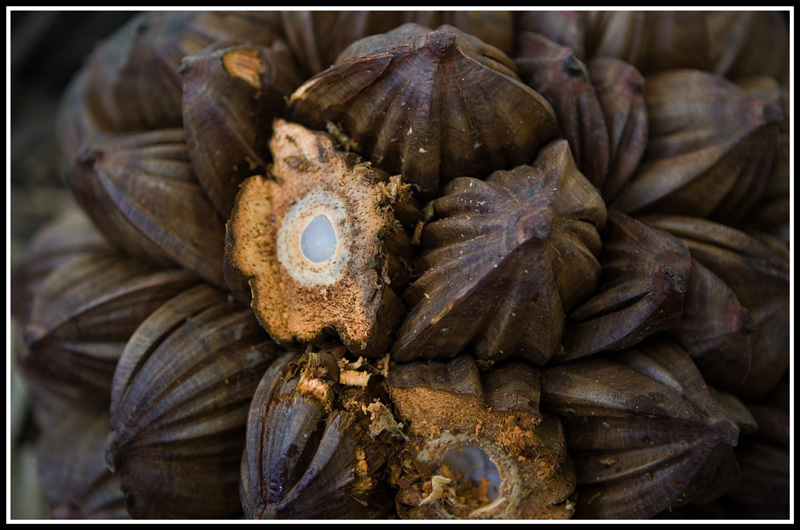 The trunk of the sago palm hides more than carbohydrates. If the tree is cut down and left on the ground - or if the trunk is split open and its shavings set aside in a container - for about three months, the eggs of a type of beetle hatch into plump white larvae that are a well-loved (by some) source of protein. After we'd seen the sago's trunk processed into flour and sampled a few sago starch snacks, we turned our attention to sago worms. 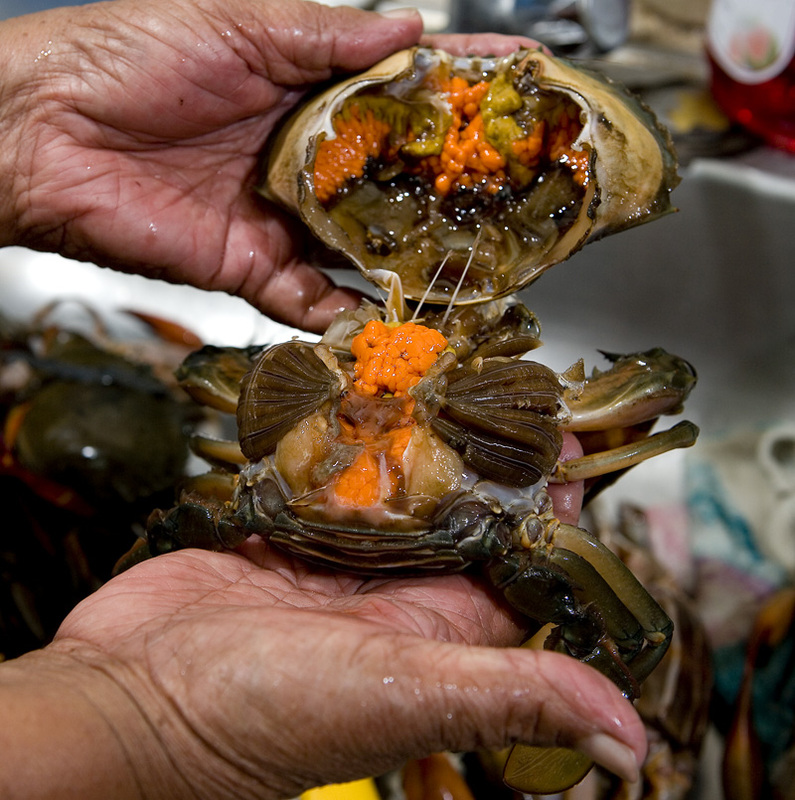 Longtime readers of EatingAsia know that we are not 'adventure eaters' and that we have a problem with the 'Bizarre Foods' approach to food travel reportage. 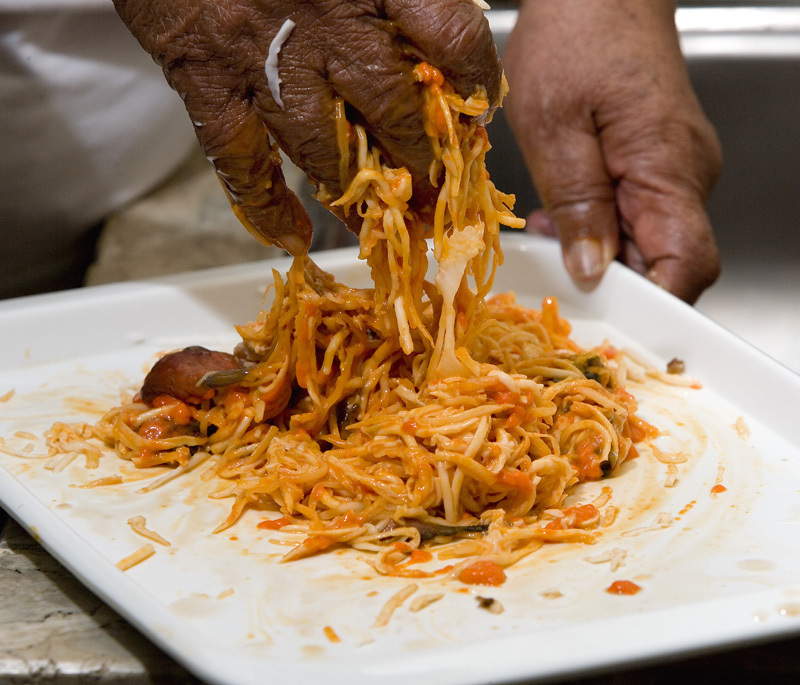 We don't land in a locale and ask to be directed to the weirdest, wackiest, wildest food possible, because we're interested in learning about cultures and people via their food, not in characterizing a locale's cuisine based on the Eeewwww Factor. 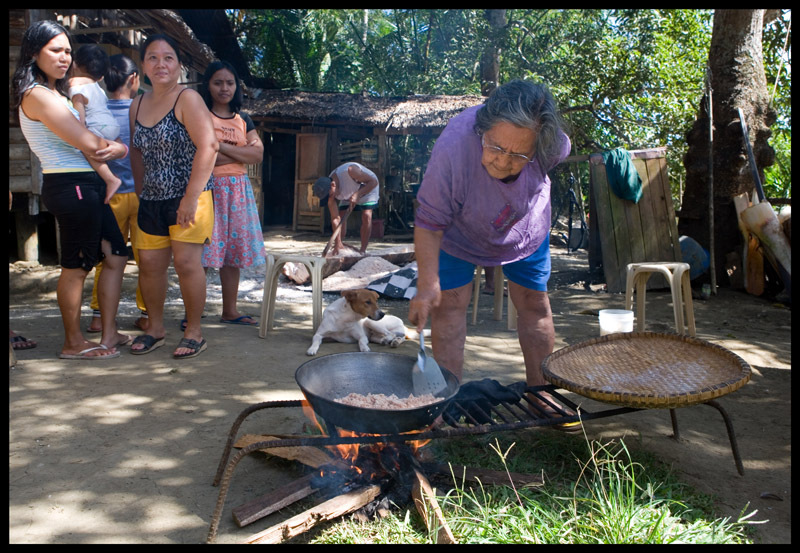 But, we came to Banza barangay to learn how a palm tree is turned into a foodstuff basic to many Southeast Asian cuisines. The larvae that grow in the sago palm are also eaten. It seemed to be something we should investigate. In this case the larvae were 'incubated' in a mound of sago trunk shavings. After the critters are unearthed they're dropped in a cup of water for a rinse. The worms varied in size from about two to five or six centimeters. 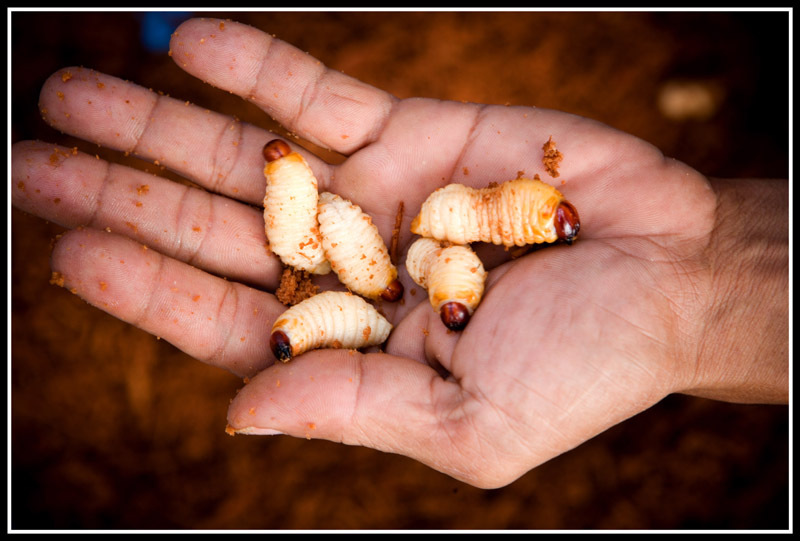 Squishing one in half reveals the source of their appeal: sago worms are nothing but head and gooey fat. 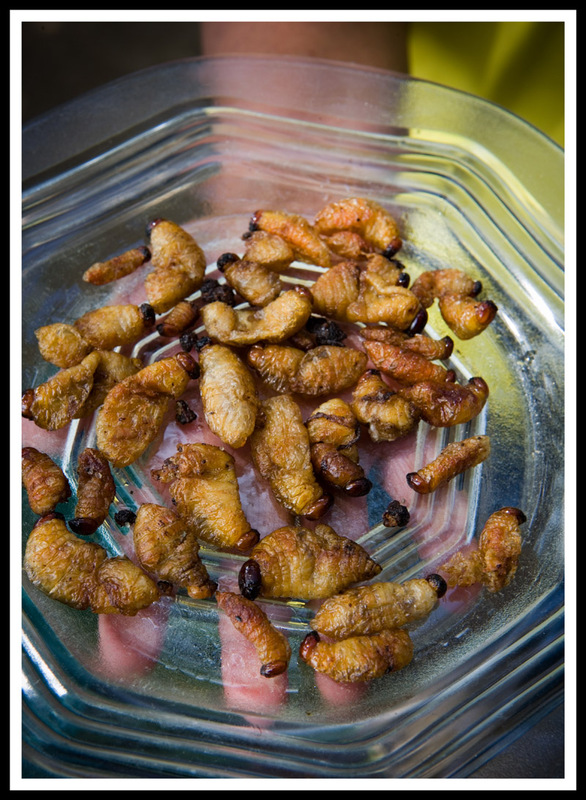 Here, the worms are often eaten as is, uncooked, just popped in the mouth after perhaps a dip in nipa vinegar or tuba (sago worm kinilaw, as it were). We couldn't go there, and here's where nurture-not-nature comes into play. 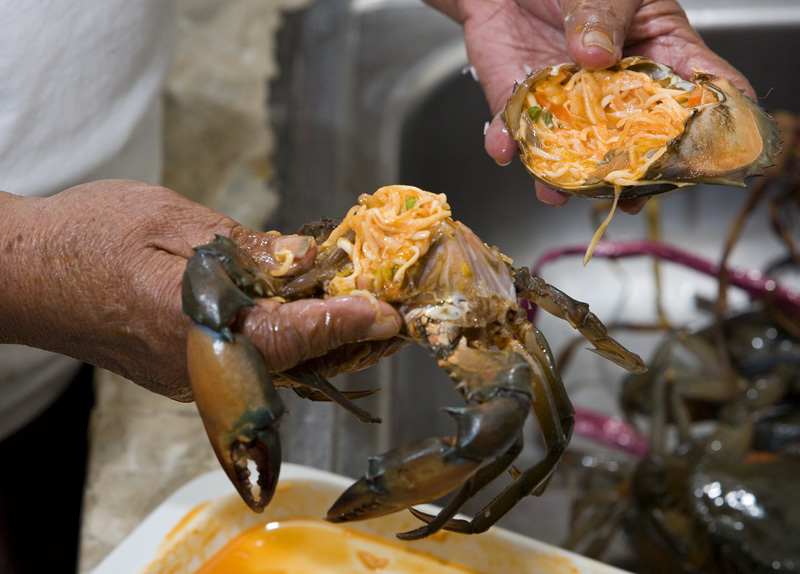 We simply could not bring ourselves to place one of those fat, wriggling things in our mouths. 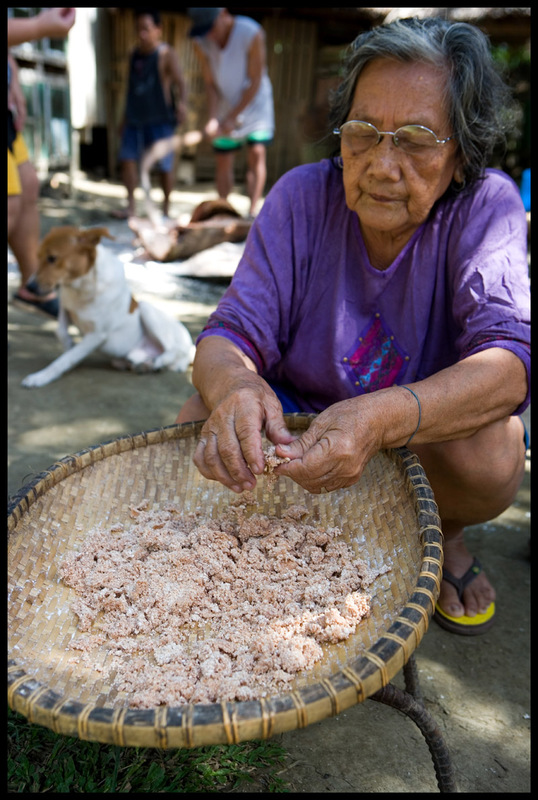 Our Filipino companion, a Manila native, had come determined to try sago worm kinilaw. He couldn't do it either. 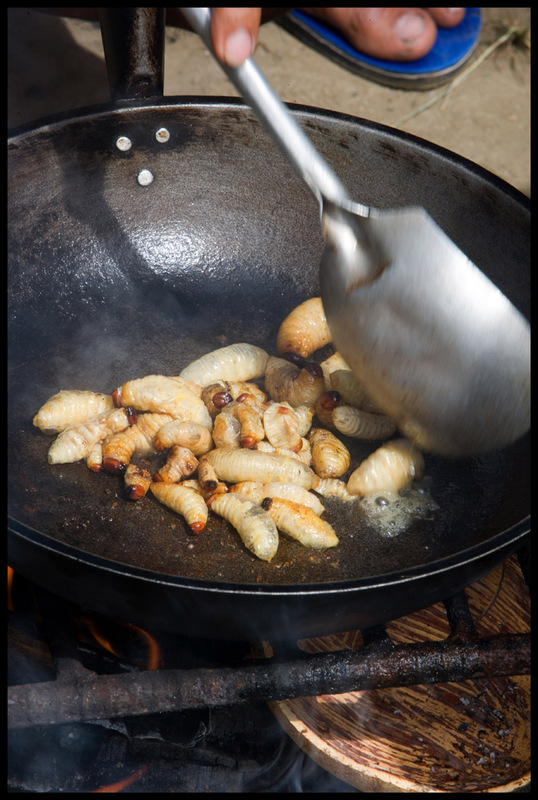 Happily for us - because we did want to taste the worms in one form or another - they're also eaten cooked. Fried in a dry pan over high heat, to be precise, with a couple of pinches of salt. As the worms cook they become translucent and, after a few minutes, we could literally see the fat bubbling underneath their skins. At this point the cook used the sharp edge of his spatula to break the skins and allow the liquid fat to escape into the pan. 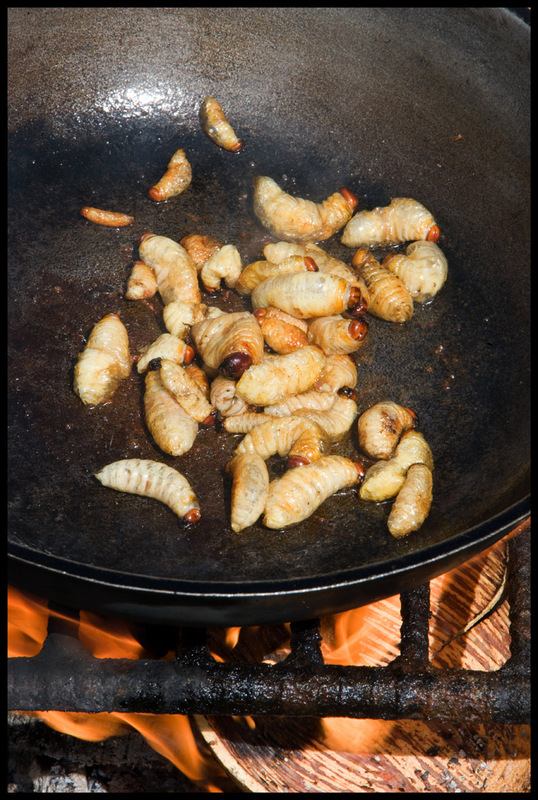 After about fifteen minutes the larvae were transformed into the golden brown, shrunken specimens in the opening photograph, something much easier to contemplate putting in my mouth than the very worm-y worms they'd started out as. And frankly, they were delicious. 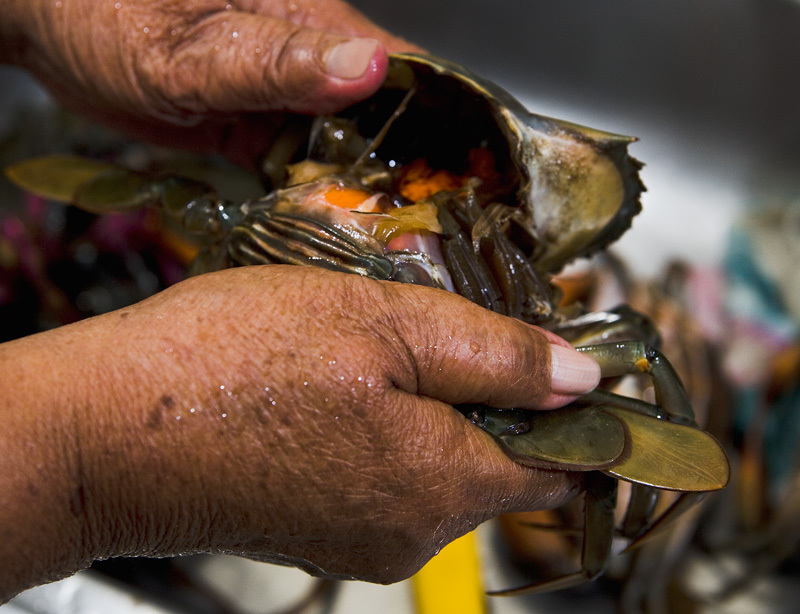 Crispy, salty, and greasy, with a lick of smoke - what's not to love? Our friend said they reminded him of chicharron; we wished for vinegar for dipping. After munching on several of the smallest larvae I went for a meatier specimen. More fat and some chewy 'meat' which, to me, evinced a pleasant bit of prawnish brine. Most of the villagers declined to partake when we offered the plate around. 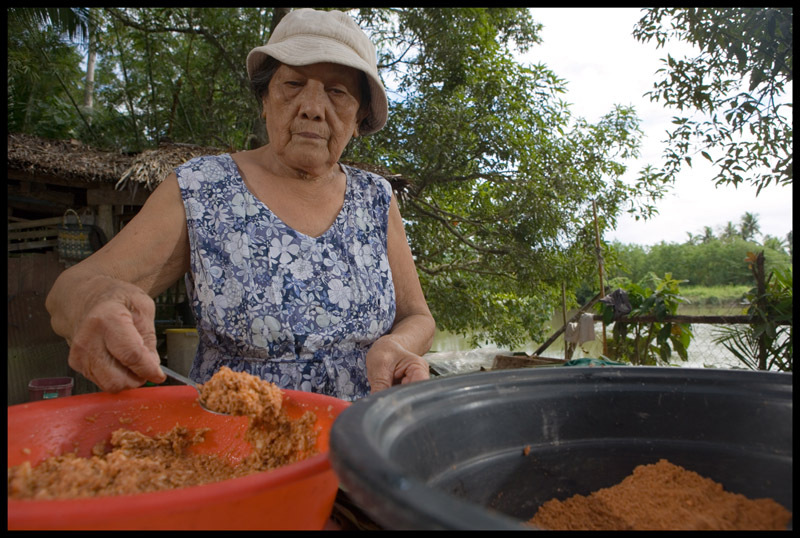 Many wrinkled their noses in disgust (especially the ladies - sago worms are pulutan or 'drinking food'; they're also, as with so many other 'difficult' foods, said to be an aphrodisiac). Would I seek them out again? No. Tasty as they were, they were far from the most delicious thing we ate during our time on Mindanao. But if a serving were laid in front of me I'd probably down a few, especially if I had an ice-cold San Miguel in one hand. So, you've chopped down a fifteen-year-old sago palm, scraped out its insides, bathed them in water and kneaded and squeezed them dry, collected the starch from the bottom of your processing vessel, crammed it into waist-high cones you made from the base of the palm's leaves, left it to drain for a few days, and ended up with more sago flour than you'll ever eat in a year. 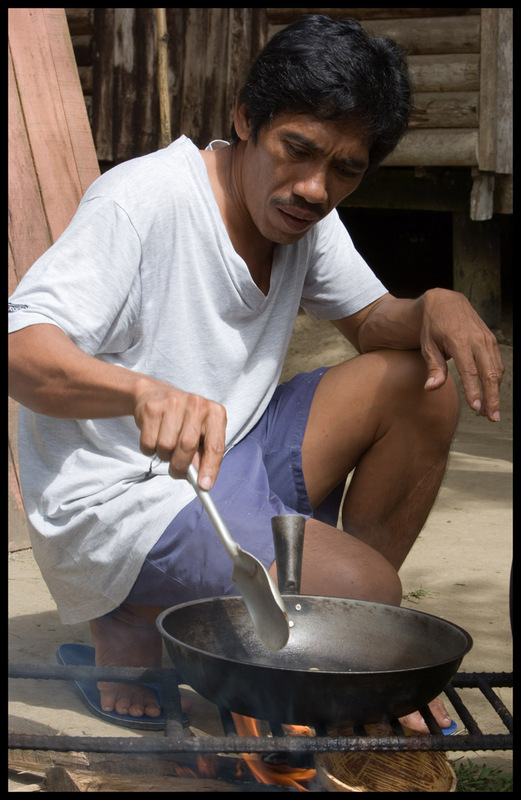 If you're in Banza Barangay,Mindanao (Philippines), you might cook up some sago flatcakes called tumpi. 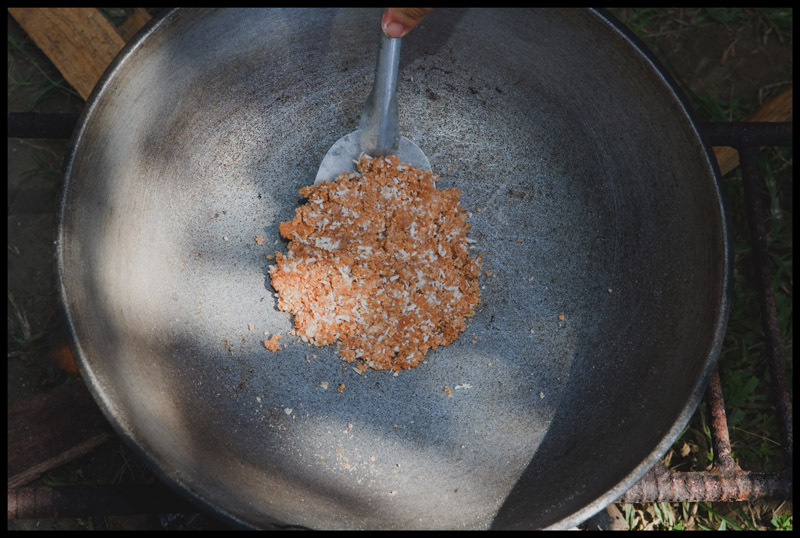 You'd begin by heating some sago flour - which is sometimes white and sometimes brick red and sometimes a shade in between - in a dry skillet so that later, when the tumpi are on the griddle, they don't get hard. As the sago toasts it comes together in tough little clumps, so after emptying it from the pan you'd break it up into small pieces. 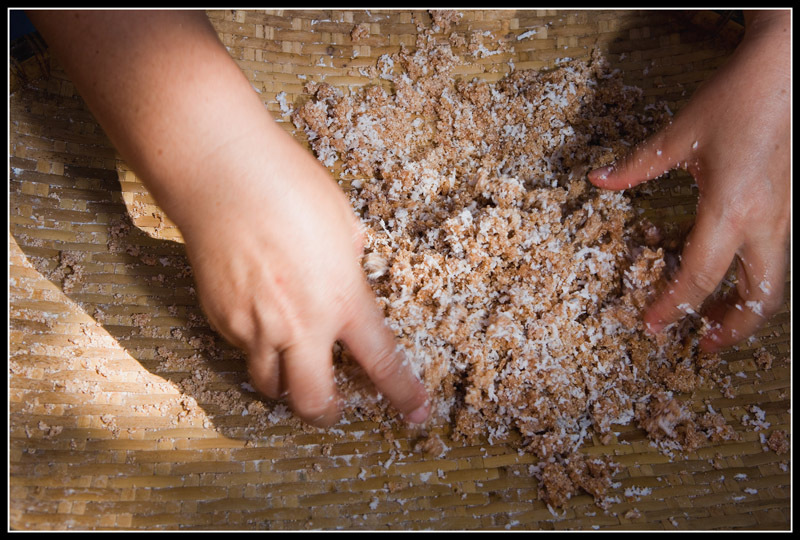 Then you'd add freshly grated coconut and knead the two ingredients together with your hands, long and hard enough to thoroughly incorporate the coconut into the flour. (If you were in the mood, you might also knead in some mashed banana or sweet potato). 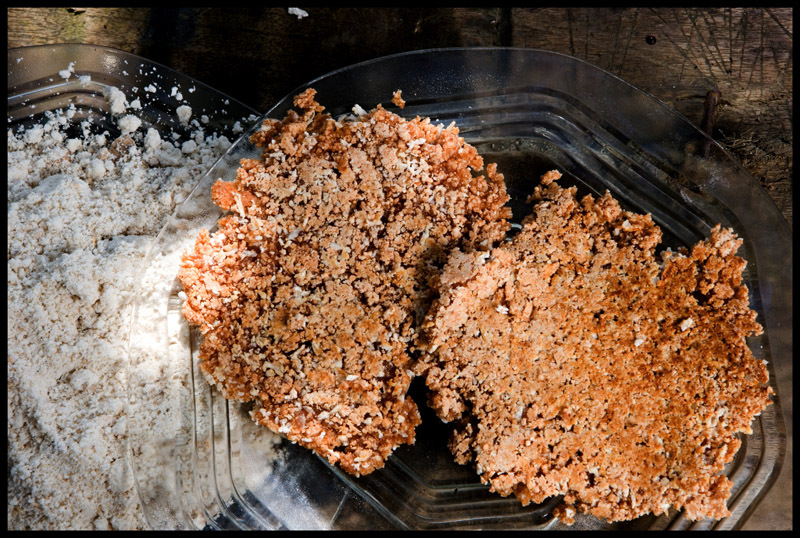 You would add cane sugar, white or unrefined - enough, but not too much, because tumpi isn't as much a dessert sort of snack as it is a lightly sweet bit of nourishment. and then you'd serve them to your visitors and chuckle at the way they rave over the crunchy-chewy texture of your everyday, no-big-deal creation. 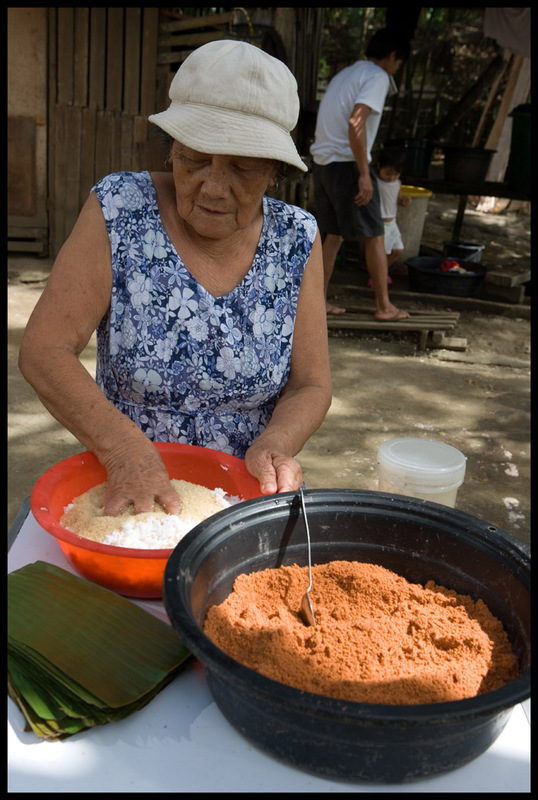 Or, if you didn't mind expending a bit more energy you might try your hand at palagsing, mixing the grated meat of a coconut not as soft as buko (young coconut) nor as hard as the old coconut you grated for your tumpi with cane sugar, and then gradually adding in uncooked sago flour. carefully wrap it side-to-side and tuck top and bottom edges under, and tightly tie two logs together, seam side in, to make water-tight seals. You'd build a fire, bring a pot of water to the boil, and add the palagsing bundles. 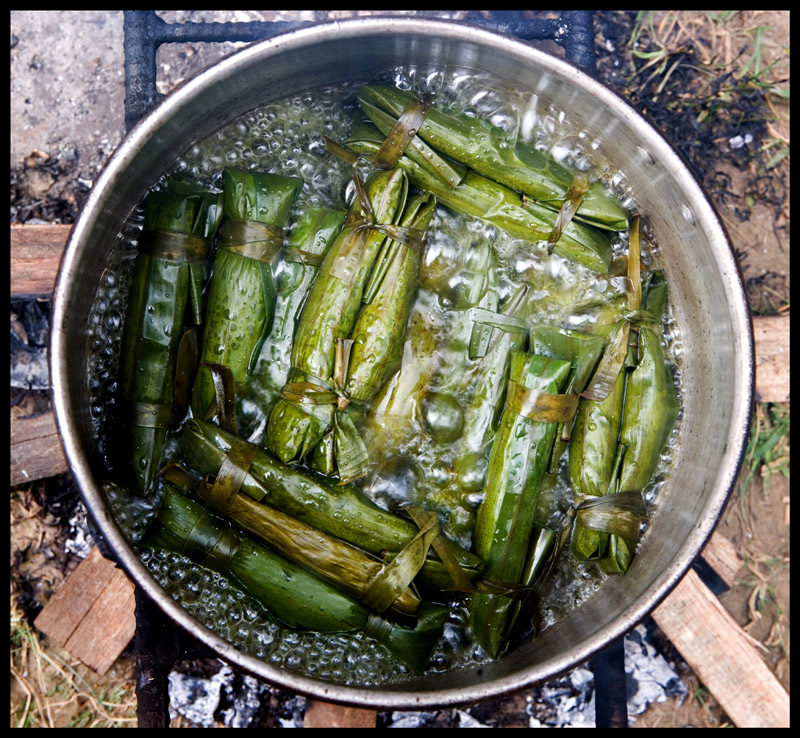 After about thirty minutes you'd pull the palagsing from their bubbling bath and pull away their banana leaf cloaks to reveal tubes that, from a distance, resemble fat-marbled pork sausages. You'd offer these, too, to your visitors, who would find them to be a fine combo of tender chewiness and - from the moist and super coconuty shredded fruit - crunch but who, residing in Malaysia (the home of gula Melaka) as they do, might think to themselves that as tasty as these palagsing are, the substitution of palm sugar for cane sugar would elevate them to a higher plane.